A new way to watch TV, the Roku LT delivers loads of channels for free. 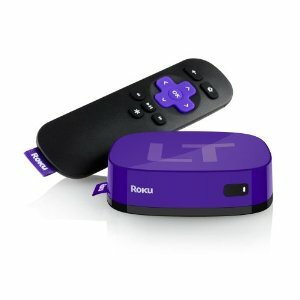 Plus, the Roku LT allows you to stream from all your favorite vendors for a fraction of the cost of cable or satellite. Enjoy 600+ channels from all the top sources such as Netflix, Hulu Plus, Amazon Instant Video, Pandora, HBO GO and MLB. Get the free app for iOS and Android for more choice. Also included is one stop search which allows you to find your favorite shows no matter if they’re on Netflix, Hulu Plus or Amazon Instant Video! Setting up the Roku LT is simple with the built in wireless and works with virtually any television. Are you a movie buff? No worries, Roku LT delivers hundreds of full length Hollywood movies from Crackle, on demand and for free! With Roku you’ll have more than 150,000 tv show and movie titles at your fingertips and ready to stream. You will also have access to premium like HBO and EPIX! Stop paying too much for television – get the Roku LT today! 1,500+ entertainment channels. Choose from the best selection and widest variety of streaming entertainment, including movies, TV shows, music, sports, news, and more.